It’s only fitting that the man who put the pedal to the metal of America’s pastime for much of the 1970s loved to ride around in a wide variety of American metal monsters of the era. In fact, before a fire destroyed about 30 of Reggie Jackson’s beloved four-wheel stable on August 4, 1988, he owned nearly 100 mint-condition muscle cars (mostly Chevrolet, but also some Mopars and Fords). Jackson began his car collection in 1971 when he bought a 1940 Chevrolet for $300 and a color television set. “Mr. October” Reggie Jackson recently provided us with a rare glimpse into his personal car collection when he placed his one-of-a-kind 1969 Chevrolet ZL1 COPO Camaro on sale in the Aug. 14 auction at the Mecum Auction in Monterey, CA. 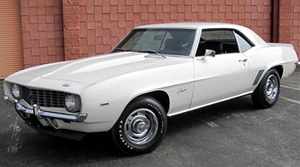 According to the auction house: As number 51 in the production sequence of 69 cars, the ZL1 Camaro was originally purchased by Chevrolet racer and engine building legend Lamar Walden, whose connection to it remains close to this day. The car remains as originally equipped with an M21 4-Speed, power disc brakes, spoilers, rally wheels, soft ray tinted glass, sport steering wheel and the original ZL1 engine...and it’s the only one of the original 69 that carried around a World Series MVP award in its trunk!